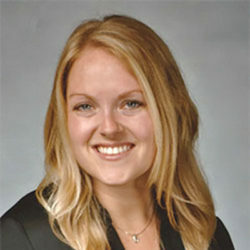 Dr. Mary K. Schroeder, “Kate” graduated with a degree in Kinesiology – Exercise and Movement Science from the University of Wisconsin – Madison before earning her doctorate from Indiana University School of Optometry. Dr. Schroeder’s optometric experience includes Bennett & Bloom Eye Centers in Louisville, KY; Atwater Eye Care Center and IU Student Health Center in Bloomington, IN; Indianapolis Eye Care Center and Eskenazi Health Center Pecar in Indianapolis, IN; and Milo C. Huempfner VA in Green Bay, WI. Dr. Schroeder is also currently seeing patients at Kaukauna Eye Care. Dr. Schroeder resides in Neenah with her husband, Justin, and their pets, two black labs and a cat. When she is not seeing patients, Dr. Schroeder enjoys spending time with family and friends and participating in outdoor activities such as boating, golfing, biking, and accompanying her husband on hunting and fishing expeditions. Dr. Schroeder also enjoys cheering for the Badgers and Packers, playing recreational soccer, and is an avid CrossFit athlete. Dr. Schroeder is a member of the Wisconsin Optometric Association and passionately provides full-scope optometric care to patients of all ages.